This sea salt is for U.S. delivery only. International customers may purchase the salt here. 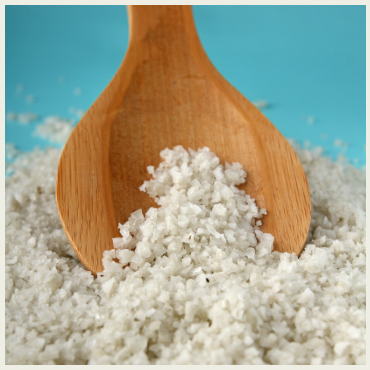 Natural and unrefined, Baja Sea Salt does not sacrifice taste for nutritious minerals and trace elements. This gourmet food salt comes from a divine estuary in the Sea of Cortez, located in Baja, Mexico. Baja natives produce it with salt-making traditions that are proven and were inherited through several generations. High quality salt is guaranteed with Baja Gold. Tides move new sea water into the estuary where the dehydration process begins with the intense solar heat and dry desert winds. Water evaporates fast to create a highly concentrated solution of sea water. Once this solution reaches a specific concentration level, it is moved to evaporation or crystallization ponds where the severe heat evaporates the leftover water. Baja Gold is then formed. Water from the Sea of Cortez has 90 minerals and trace elements, as well as over 50,000 natural organic compounds. The use of unique salt-making techniques make certain that all minerals and trace elements found in the sea water are also present in Baja Gold Sea Salt. What makes Baja Gold unique? Baja Gold Sea Salt is naturally low in sodium chloride, and remains untouched once solidified. This differs from international salt companies that wash their sea salt to create pure white crystals, remove the minerals and trace elements, and result in 97-99% sodium chloride. The salt gets its exceptional flavor from its minerals, such as calcium, magnesium, potassium, and trace elements, such as gold, yttrium, and zinc. Health professionals recognize that Baja Gold Sea Salt consists of minerals and trace elements that are known to be lacking in human diets, although they are so essential for a healthy body. Gourmet chefs enjoy the new taste dimensions that Baja Gold adds to their creations, as well as how it increases the gastronomic value with its soft texture and flavor. Add a nutrient boost to your food with Baja Gold Sea Salt today! For more nutrient and mineral rich body balancing food salt, shop Healthy Salt from Creatrix Solutions.